First Listen: Rufus Wainwright, 'Out Of The Game' Out of the Game succeeds because Wainwright remains stubbornly himself: pouring vibrato into each long vocal line, reaching for the higher note in a chorus, unfolding song lines that only make sense once he's luxuriating in them. 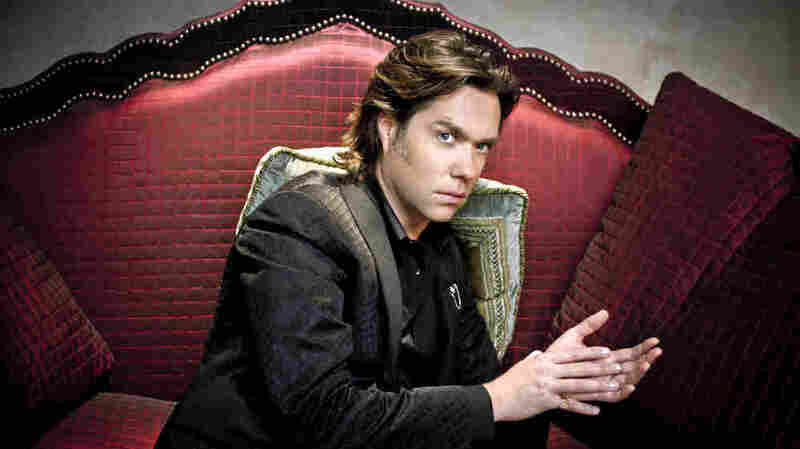 Rufus Wainwright's new album, Out of the Game, comes out May 1. Those who greatly admire Rufus Wainwright and his swoony oeuvre don't just love him for his looks or for his family ties, though anyone who enjoys the sound of life becoming art is intimate with the richly songified saga of the intertwined Wainwright, McGarrigle, Roche and Cohen clans. We don't simply gawk at the free-spirited eclecticism that's led him down so many fruitful side roads, from cabaret pop to opera to his Judy Garland tribute. Nor do we merely enjoy his panache. The mordant wit, the sharp observations about bohemian life as a member of Generation XYZ... yes, those we appreciate, but they're not the key. The key is his gift for melody. Wainwright's music throws lines in the air with a grace and confidence rarely heard in contemporary music. As an indie-pop melody maker, Rufus Wainwright has few peers — maybe Colin Meloy of The Decemberists, or Joanna Newsom. There's something dazzling about Wainwright's writing, brought to life by his grandiloquent piano lines and a tenor always pirouetting on some edge. He is the daring young man on the flying trapeze, and devotees love him because of the way he flies. Great melodicists aren't as common as you'd think. With so much music already out there, it's easier for songwriters to simply weave together old earworms, rather than going somewhere new. Wainwright has never done that. As historically minded as he may be, steeped in the traditions of both the symphony hall and the Montreal nightclub, Wainwright has formed a language of his own by constantly pushing against conventional song structures, building new forms that seemed to mirror his own complex interior monologues. Out of the Game, Wainwright's seventh studio album (out May 1), seems at first to set restraints on the wild wandering that has drawn listeners in ever since Wainwright's 1998 debut. This new work is produced by retro-soul fitter Mark Ronson, known for creating chic frames around outsize personalities like Amy Winehouse, Robbie Williams and Lily Allen. Ronson does gather context around Wainwright's core compositions: The title track has a Muscle Shoals country-soul feel, while "Bitter Tears" evokes the drama of Dusty Springfield and "Perfect Man" bears a hint of Hall and Oates. Ronson's goal, it seems, isn't to put a vintage costume on Wainwright, but to connect his work with that of older boundary-pushing tunesmiths like Van Dyke Parks and especially Harry Nilsson. Wainwright is game to make these connections, but only up to a point. Out of the Game succeeds because he remains stubbornly himself, pouring vibrato into each long vocal line, reaching for the higher note in a chorus, unfolding song lines that only make sense once he's luxuriating in them. Ronson's challenge is to apply his toolbox to Wainwright's compositions without dominating them. It's thrilling when the two talents come into alignment. The backing chorale in "Barbara" provides Wainwright with a mini-skirted Greek chorus as he waxes cool about the loneliness of drinking rose in the rain. A groovy bassline flirts with his piano in "Jericho," but doesn't push it too hard. And the heavily reverbed, almost surf guitar of the quiet "Sometimes You Need" frames Wainwright's lyric about the lure of infidelity, writing in an undertone of the 1970s while keeping Wainwright's musings in the present tense. The best stories on Out of the Game are personal, reflecting the major life changes of a man growing up gracefully. Wainwright became a father in 2011, forming a family with the child's mother — Lorca Cohen, a lifelong friend — and his partner (and soon-to-be-husband) Jorn Weisbrodt. He lost his own mother, the singer-songwriter Kate McGarrigle, the year before. The most moving songs here pay vulnerable tribute to these significant others, from the domestic fantasia of "Montauk" (a dream for daughter Viva) to the elegy of "Candles," a song nearly eight minutes long, signifying how hard it is for a mourning son to let go. Like most of Wainwright's works, this one includes contributions from close friends and family members, including sister Martha and friends Sean Lennon and Thomas "Doveman" Barrett; Ronson brought in his own Rolodex, recruiting A-list studio denizens like The Dap Kings and Nels Cline. Still, it's that dialog between writer-performer and producer, a game of friendly, artful pushes, that makes Out of the Game special. That, and the flying — closer to the ground now, but still magical.